Okay wait, that’s not really true; I’m actually doing the same amount of life. I’m just fitting it into better containers of time, because I’m making more space to rest. We know that we do things better when we’re rested, because we’re more energised. We know that we see more clearly when we’ve had some time out. We know that going for a walk around the block and getting some fresh air—as simple as it sounds—can dramatically shift our mood. And yet we don’t always honour what we need in the moment. We make up stories about needing to earn it; waiting until every single thing has been ticked off the list. And yet we can actually tick them off more easily, more joyfully, when we’re feeling grounded, focused and energised. I’m usually pretty good at carving time off, and time out, but lately I realised I’d been really pushing that to the limits. As in, I’d carve out time off, but only a little bit. I’d make time to rest, but way past the time my body actually needed it. I’d give myself a break, but it wasn’t really long enough. On Monday evening, self-care looked like missing yoga to drink tea and do a short 10min meditation at home, before going for a quick stroll around the block after sunset to get some fresh air; then home to throw some veggies in the oven. My wrist has been a little sore (from sleeping on it funny, and typing typing typing), so I listened to my body. While I would’ve loved to head to my usual yoga class, I did the next best thing, and gave my mind what it needed after a full, huge day at my desk; rest. A simple meditation and I found myself feeling energised for the evening ahead. 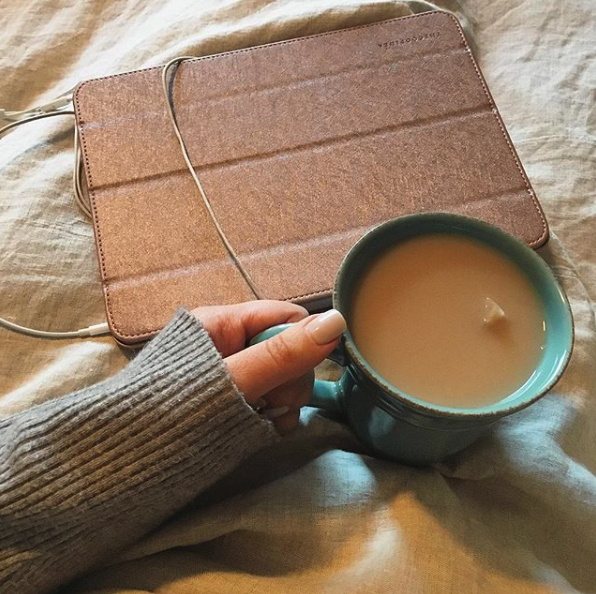 On Tuesday, self-care looked like doing all the things for most of the day, and then finishing work by 4pm to do nothing at all… but hop into bed, watch a show and read, with tea, before heading off to a pilates class. Yesterday, it looked like starting the morning as slowly as possible, and doing some journaling and inner work before I started my day. Today it looks like heading off to a midday yoga class with a girlfriend, and then going out for lunch, before coming back to my desk to finish my work for the day. Tomorrow? I’ll see what feels good in the moment. I’ll honour what my body needs; no questions asked. Every day, your self-care will look different, and that’s perfect; as long as you actually allow yourself to carve out some time, and honour what you need most. I’ve felt more grounded, focused, and energised this week, for the simple fact that I’ve listened to my body, and honoured what I needed most in the moment. Try this for a few days, in whichever way you can, and see how you feel. Let yourself do less, or at least, create some space to rest up, restore, and centre your energy… so that when you do more, you can feel more grounded, focused and energised too.